Though triskaidekaphobes—those who fear the number 13—recoil over today's date (and a Friday the 13th at that), they can take solace knowing that there is only a very low probability that the sun will bombard Earth today like it did on March 13, 1989. Unless, that is, this writing jinxes it (speaking of superstition). On March 10, 1989, a CME about the size of 36 Earths erupted from the sun's roiling surface and ripped through space at a million miles (1.6 million kilometers) per hour. Two days later, the torrid gas cloud crashed against Earth's magnetosphere—the magnetic field generated by the planet's spinning molten iron core that helps deflect the solar wind and more potent solar jetsam. This blast from the sun severely disrupted the magnetosphere and set off a geomagnetic superstorm. As Sten Odenwald, an astrophysicist at The Catholic University of America in Washington, D.C., relates in his book The 23rd Cycle, what ensued was one of the grandest displays of auroras—usually manifested as the aurora borealis (northern lights) or aurora australis (southern lights)—in recent times. Auroras form when Earth's magnetic field funnels highly energetic particles toward the poles where the field emanates. There, the charged particles strike molecules in Earth's atmosphere that release photons of various colors (red hues come from oxygen, for example) and light up polar regions in frequent auroral displays. Most significantly, at about 2:45 A.M. local time on Monday, March 13, Canada's Hydro-Québec power utility's grid crashed when safety systems sensed a power overload caused by the currents pulsing through the ground. The failure knocked out electricity to six million people in northeastern Canada for as long as nine hours—the biggest outage ever caused by a geomagnetic storm. 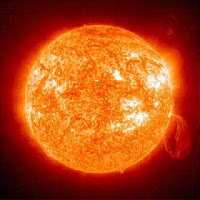 The sun currently is experiencing what is called the solar minimum—the least magnetically active period of an 11-year cycle. As telltale dark blotches on its surface called sunspots multiply, indicating magnetic upswells, solar flares and CMEs grow in frequency, peaking just after the solar maximum. The next such tempestuous season is slated for 2012 or so. The chances of a truly devastating power outage from space weather remain low, the report says. But should one occur, it warns, modern society's dependence on electrical power to maintain everything from banking systems to potable water supplies could indeed cause a national—if not international—emergency costing trillions of dollars over years of recovery. And for the heliophobes out there, you can count down the days to solar maximum on Odenwald's www.solarstorms.org page as well. As of March the 13th, 2009, it's 717.